40 years ago, thousands of Sahrawi were driven from their homes. Akhdaja Salak, who was 22 and pregnant at the time, describes the experience. Akhdaja Salak was 22 and pregnant when Morocco first occupied Western Sahara. Photograph by Saharawi Voice/Adam VanNoord . It’s early September 1975 and Akhdaja Salak, 22, is sitting in her home in Ajdiri, Western Sahara. She is seven months pregnant and still undecided about what to do to next: whether to take the risk of staying at home or leave and endure the pains of travelling while heavily pregnant. 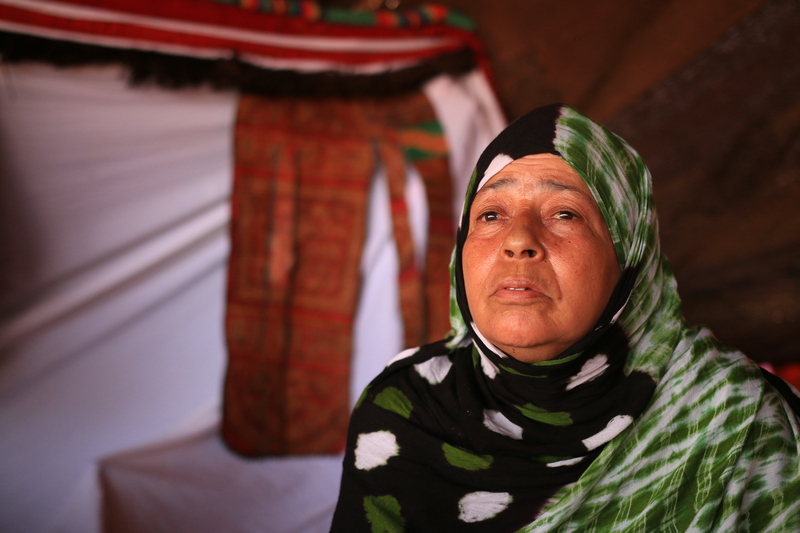 Akhdaja’s fears started when she first received the news that Morocco was preparing an armed invasion to occupy Western Sahara. In 1973, the Saharawi Liberation Movement (the Polisario Front) was founded to fight for independence from Spanish colonisation. Two years of Polisario attacks forced the Spanish to retreat from Western Sahara’s interior to the coastal cities and reluctantly accept negotiations. The two sides agreed that the Polisario would stop its military attacks and release Spanish prisoners of war, and that in return Spain would withdraw from the region. In neighbouring Morocco, the monarchy had its own ideas. The palace had declared that Western Sahara was part of Morocco’s historic empire. King Hassan II was angered by Spain’s negotiations with the Polisario and further disappointed by the International Court of Justice ruling that dismissed Moroccan and Mauritanian claims of territorial sovereignty over the region. Nevertheless, on 31 October, 1975, the King ordered his military forces to invade Western Sahara. Akhdaja’s worst fears became a reality. Her city lay 90km from the Moroccan town of Zak and was the first Saharawi city to be occupied. Fortunately, she was away from her home when the soldiers came. “We spent about a month in the Sagui Valley. We hid the whole time under trees, and Saharawi fighters would bring whatever supplies they could manage to take with them. Some of the fighters had to go back to Ajdiri to bring more supplies, but then they were captured by the Moroccan military and taken to Agdir in Morocco,” she recounts. The Moroccan forces continued to advance despite the Saharawi resistance that was divided between fighting the invading army and trying to save the lives of the fleeing population. “A very close area fell under Moroccan control, so we had to go in the direction where those fleeing the invasion were going. We had no vehicles and we walked all the distance for 35 km in one night, because night provided us with the cover necessary to not be spotted by Morocco forces who were looking for any Saharawi escaping their forces,” says Akhdaja. The journey was long and hard. “By noon we arrived at an area called Lamrira [“bitterness” in Hassaniya, the Sahrawi language],” she continues. “There was water there, but it was almost unfit to drink because of its bitterness. There we met another 300 Saharawi who were also fleeing the invasion. There were only two land-rover trucks to take us on the next stage of our journey, so the trucks took one group while others waited for them to return. When our turn came, we went to Arni and stayed until the Tifariti camp was bombed. Then we moved to Birtulated where I gave birth to my first child. There was no medical equipment or nurses around. All I had was the other women who had little to offer but their prayers. On 6 November, now 40 years ago, the Moroccan king called together his subjects for what was called the “Green March” into Western Sahara to “recover that part of the homeland”. They flew American and Saudi flags and carried copies of the holy Quran. “Green” was chosen as a name for the march as a symbol of Islam as 300,000 Moroccans crossed into fellow majority Muslim country. In the collective memory of Moroccans, the image of Western Sahara’s invasion is a romantic one. There’s no mention of the atrocities committed before and after the “Green March”, which most Saharawi refer to as the “Black March”. Akhdaja continued on her arduous journey, this time towards her final destination. While the men were fighting Moroccan and Mauritanian forces, the Saharawi women were tasked with running the refugee camps in the barren desert. “After settling in the camps, the women started to make mud-bricks, and they built classrooms for their children to be educated, dispensaries for their patients, and administration to organise their daily lives. Then we started to see more and more humanitarian aid from Algeria and other humanitarian NGOs,” says Akhdaja. In 1979, Mauritania was forced to sign a peace agreement with the Polisario and renounce their claims to Western Sahara, but the war between Morocco and the Polisario continued until 1991 when the UN brokered a ceasefire agreement that was to be followed by a referendum. Due to Moroccan obstructions and the UN’s unwillingness to pressure Morocco, that referendum has never taken place. “40 years later, the Saharawi now have one of highest literacy rates in Africa, thousands of graduates in all fields, and 40 years of democratic traditions. But despite all those small improvements, we are not comfortable, because in the end we are not in our homeland. The sense of tranquillity and stability is something that will always elude us, so long as we are not in our land,” says Akhdaja. Mohamedsalem Werad is a journalist focusing on issues concerning the Western Sahara. He is based in the refugee camps in Algeria. What is Thomas Lubanga Charged With?